I always find it interesting when I find out what someone's favorite dessert is, whether it be a cookie, cake, pie, etc. Take my own family for instance. I love ice cream, my sister loves cookies, my mom's fave is cake, and my dad will take pie over anything else. The neat thing about knowing someone's favorite treat is that you get to see their eyes light up when you make it for them. Case in point. My friend recently had a birthday. As I do every year, I gift her with a cookie assortment. Over the years, I've given her various types - peanut butter, chocolate chip, chocolate mint, snickerdoodles, etc. 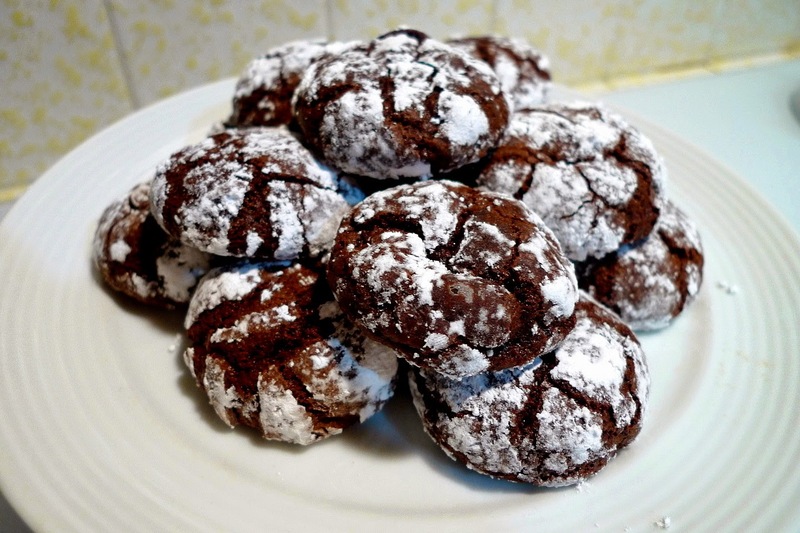 But, last year, I happened to make these Chocolate Crinkles for her, and voila! I found her FAVE cookie in the world just like that. She raved about them and couldn't get enough. So, this year, when her birthday rolled around again, I remembered and made these cookies for her. She was thrilled!!! As soon as I gave them to her, she opened up the bag and began eating them in complete and total delight. I have no doubt that the dozen cookies did not last long. And, who can blame her? These cookies are amazing! Rich, chocolatey, fudgy, like a cookie and brownie rolled into one. With the powdered sugar adding a crispy, sweet, outer shell to counteract the soft, dark middles, they are simply irresistible. Try them and you're sure to find that they'll be your new favorite too. Combine the butter and chocolate in a double boiler and stir until the mixture melts. Remove from heat and let cool. Beat the eggs, sugar, and vanilla until well combined. Mix in the chocolate mixture. Stir in the flour, cocoa powder, baking powder, and salt until well combined. Chill the dough in a covered container for at least 2 hours. Remove the chilled dough from the fridge and roll into 1-inch balls. Roll the balls in the powdered sugar until completely coated. Place on a parchment paper lined baking sheet and bake at 350F for 12 minutes. My husband loved these cookies so much that he told everyone he knew about how good they were. The kids loved them too!